Most modern bone beads are made from cow or sheep or camel bones. Bone is a durable material that is hard enough to wear well, but soft enough to be worked with nearly any hard tool. 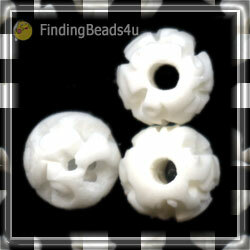 Today, bone beads are popular for trendy bead amulets, often carved with traditional designs for primitive motifs. Since these beads are still hand carved every one is unique. Some of these unique hardcrafted natural beads can be found on ClearlyChosen at attractive pieces. While most bone beads are cream colored, brown or black they can be found in every color of the rainbow. Many are stained black or brown to make them look old. Others may be colored with analine dyes, but natural is the most popular color. Bone vs Ivory Bones are an organic substance made of calcium phosphate and gelatinous protein compound - lending itself to bead making very well. Bone has long been used as a substitute for ivory and at first glance the two look similar. There are some very basic differences. The most obvious is that bone is heavier than ivory. Another is that upon close examination bone and ivory have very different appearances. Bone shows concentric layers and a dry appearance. Ivory, on the other hand, has a crisscross pattern and can be polished to a deep luster because the natural gelatin has not been removed.